My first experience with a Yorgos Lanthimos film came two years ago when, in a spur of the moment decision, I decided to see what The Lobster was about while attending my first Toronto International Film Festival. I walked out of that film a little mystified and largely confused about what I'd just experienced and, looking back, that was undoubtedly appropriate. While I wasn't overly fond of the film I found myself thinking about it day after day in what likely ended up being the film my brain latched onto the most out of that festival as far as contemplating what it meant and how it was crafted (there were other films I liked more because I understood their intent and execution better). Months later, I found myself eager to purchase the Blu-ray when the film arrived on home video and to re-watch what had perplexed me. I made it through about half of the film before it started to feel like the great concept and idea that half presented began to wear thin. I haven't returned to the film since, but I wouldn't mind trying again. 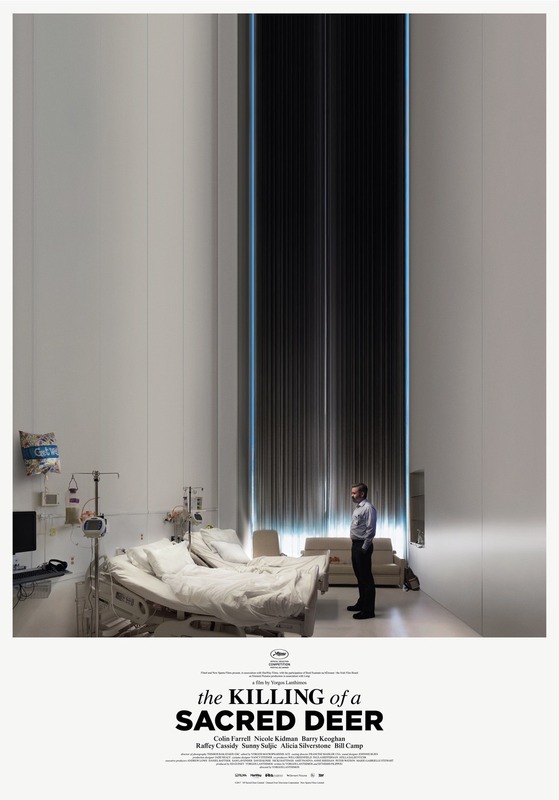 To this day it's just one of those movies that completely puzzles me and thus is the reason I'm rather excited to see what Lanthimos has in store for audiences with his follow-up The Killing of a Sacred Deer. The film follows a teenager's attempts to bring a brilliant surgeon into his dysfunctional family which takes a series of unexpected turns. The director reunites with star Colin Farrell who plays the aforementioned surgeon and while this first look at the film doesn't offer much by way of what exactly is going on it certainly sets the tone for what to expect as it has Raffey Cassidy of Tomorrowland performing a haunting rendition of Ellie Goulding's "Burn," whose lyrics take on a whole new meaning when paired with images of Farrell carrying kids through white hospital hallways and dropping them on their knees, kids crawling across the floors of picturesque houses, or kids simply being pushed over; there's a coldness to it all and a seeming atmosphere of horror I can't wait to see unfold on the big screen. There is also some rather cryptic, but equally disturbing dialogue that serves to highlight the screenplay from Lanthimos and Efthymis Filippou that I'm anxious to see how it might play into the larger picture. Needless to say, this is on my "need-to-see" list for this year's TIFF. The Killing of a Sacred Deer also stars Nicole Kidman, Barry Keoghan, Sunny Suljic, Bill Camp, Alicia Silverstone, and opens on October 27th, 2017.